Lemon poppyseed cake was something new for me when I moved to this country in 2002. I’d never heard of the combination, and clearly didn’t realize it was a thing. I remember seeing a box of Knudsen lemon poppyseed cake mix at the grocery store and thinking, that would make a good muffin. Shockingly, it turns out I wasn’t the first one to make that leap. Fast forward a decade, and box mixes are all but banned from my kitchen. (A rare exception may be tres leches cake, which for reasons unknown, turns its nose up at my homemade yellow cake and seems to soak up all that leche goodness better with a box of Betty Crocker. I’m still smarting over this affront.) And the lemon poppyseed has come a long way, too – lemon zest rubbed into sugar! additional fruit! punchy glazes! This new experiment may become a favorite. For one, it features my favorite of all the spring/summer bumper crop of fruit. I know strawberries may be the more popular choice, and rhubarb is what the true foodie sophisticate prefers, but cherries do it for me every time. One of the only “specialized” kitchen gadgets I own is a cherry pitter, which should tell you about the depth of my love. 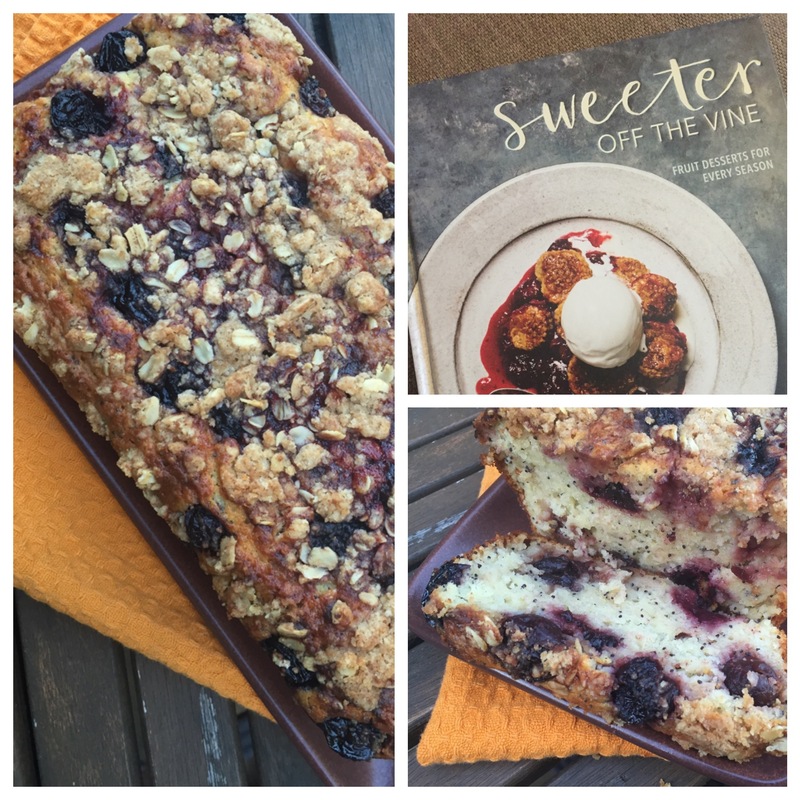 This recipe is from a fantastic new book, Sweeter Off the Vine by Yossi Arefi, a baker I have long admired for her unusual flavor combinations and droolworthy food photography. The ultimate vote of confidence came from our three year old, who cried when he discovered we were down to the last slice. So, there you have it. Cake so good, it could make your toddler cry. Not that they really need a reason. Preheat the oven to 350ºF. Butter a 9-inch loaf pan, dust with flour, and tap out any excess. Make the streusel by mixing the 1/4 cup flour, oats, brown sugar, poppy seeds, cinnamon or cardamom and salt in a small bowl. Add the butter and use your fingers to break the butter into small pieces, until the streusel is in small bits. Set aside. To make the cake, whisk the flour, baking powder, poppy seeds and salt together in a small bowl. In a large bowl, rub the sugar and lemon zest together very well with your fingers, encouraging the lemon oil to saturate the sugar. Whisk in the oil, eggs, yogurt and lemon juice. Add the flour mixture all at once, stirring with a rubber spatula until it’s almost completely incorporated. Fold in half of the cherries and scrape the batter into the prepared pan. Let the cake cool on a wire rack. When cool, run a knife along the outside of the cake to help it release from the pan and tip the cake out of the pan.